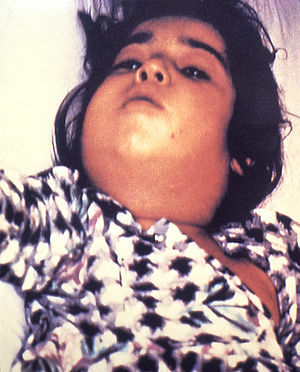 Diphtherie can cause a swollen neck, whiles referred tae as a bull neck. Diphtherie is an infection caused bi the bacterium Corynebacterium diphtheriae. ↑ 1.0 1.1 1.2 1.3 1.4 1.5 Atkinson, William (May 2012). Diphtheria Epidemiology and Prevention of Vaccine-Preventable Diseases (12 ed.). Public Health Foundation. pp. 215–230. ISBN 9780983263135. Archived frae the oreeginal on 15 September 2016. ↑ 2.0 2.1 "Diphtheria vaccine" (PDF). Wkly Epidemiol Rec. 81 (3): 24–32. 20 January 2006. PMID 16671240. Archived (PDF) frae the oreeginal on 6 June 2015. ↑ "Diphtheria". who.int. 3 September 2014. Archived frae the oreeginal on 2 April 2015. Retrieved 27 March 2015. ↑ GBD 2015 Mortality and Causes of Death, Collaborators. (8 October 2016). "Global, regional, and national life expectancy, all-cause mortality, and cause-specific mortality for 249 causes of death, 1980-2015: a systematic analysis for the Global Burden of Disease Study 2015". Lancet. 388 (10053): 1459–1544. doi:10.1016/s0140-6736(16)31012-1. PMC 5388903  . PMID 27733281. This page wis last eeditit on 24 Julie 2018, at 05:09.